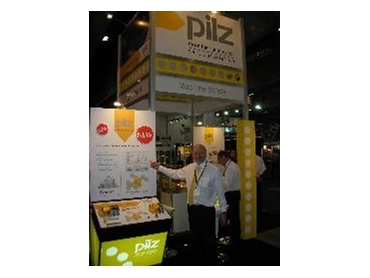 Ferret caught up with Frank Schrever from Pilz at National Manufacturing Week Melbourne 2009 to discuss some of their new range of Pilz products on display at the show. Schrever was keen to point out that with the current economic climate, and with Manufacturing being the second largest employer in Australia, not only were shows like National Manufacturing Week instrumental to Manufacturing in Australia, but that Ferret, as Australia’s leading online destination for the Manufacturing and Industrial industries is integral to the industries' ongoing growth and success. Pilz took the opportunity to display their new PSENcode safety switches at National Manufacturing Week 2009. The new non-contact, coded safety switches PSEN cs3.1, PSEN cs4.1 and PSEN cs4.2 from Pilz expand the PSENcode product range, adding a new version which is significantly smaller – but offers the same level of manipulation protection. All the coded safety switch functions are incorporated within the smallest space – 37mm x 26.4mm x 18mm – offering every benefit for a more flexible installation plus series connections with PSENslock safety gate systems and other switches in the PSENcode product range. The installation concept corresponds to the new generation of non-contact, magnetic safety switches PSENmag.